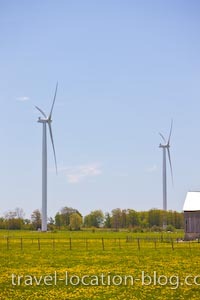 Three large turbines positioned along Highway 6 on the Bruce Peninsula produce enough energy for the immediate area as an alternative to fossil fuels, nuclear, or hydro dams. We head away from the Bruce Peninsula National Park and Fathom Five National Marine Park today. The first destinations lined up for the day were Sauble Falls and Sauble Beach, and as it turned out they would be the only destinations. Time just flies - as you've heard me say before: Canada is such a large chunk of land, you can travel for miles and not really feel like you've gone anywhere! There are also so many interesting places to stop along the way that time runs away on us. Heading south from the tip of the Bruce Peninsula, we passed by three large wind turbines - part of a wind farm which produces enough power to supply the homes in the immediate area. The bulls in the surrounding paddocks seem unperturbed by the constant motion of the blades while they feast on the lush grass amongst bright dandelions - food is more important I guess!! It's great to see communities turning to renewable energy and alternatives to fossil fuel.